When I register for races, I dutifully fill out all information – name, age, medical conditions (for me, asthma) – and don’t really think about it again. Yesterday, I realized how vital the data on a bib is. I was marshalling at the Dawn at the Don, a 5K and an 8K race that supports my club, Toronto Olympic Club. For me, it was a family affair as I dragged hubs and the boys out of bed at the crack of dawn to help at the race. Skipper was placed at the finish line, Dave went to marshal at the 8K turn-around and Little Ironman stayed with me at the 3K mark. My post was next to one of the water stations; we also had a First Aid provider with us. LI and I were directing runners and reminding cyclists to be mindful of the runners. About 20 minutes into directing runners, I looked right and watched one bump into one of the water girls and fall to the ground. The woman’s legs had collapsed and the rest of her body slowly followed. Fortunately, she had bumped the gal at the water station, who was able to guide her to the ground so that she didn’t hit her head. Within a minute, her eyes had completely dilated; all you could see was white and black, and she started to foam at the mouth. Two first aid providers checked ABC’s (Airway, Breathing, Circulation) and all were there. All we could do was wait for an ambulance and keep checking her ABC’s. While marshalling and trying to keep other runners from noticing what was going on, I couldn’t help but hear what was going on. The woman was non-responsive to any questions the providers asked. They wanted to know who she was, if anyone knew her, and if she had any medical conditions. No one could help them. “Check her bib. Her name should be on her bib,” I said. Once we had it, I called the marshall at the finish line so that we could locate her husband. There was nothing on her bib about diabetes or a history of seizures. “Do we know how old she is?” Again, I looked at the bottom of the bib and told them “43”. The bib had everything we needed. Thank goodness that she registered ahead of time as day-of registrations typically only have the number. When the ambulance arrived, the first aid providers were able to answer all of the paramedics’ questions, thanks to the bib. And they had a few others. “Does anyone know how far she ran? Is she part of the 5K or the 8K?” No one could answer that. “Wait! What colour is her bib?” I asked. The paramedic blinked, appearing surprised that the answer came from something that simple. They left for the hospital and her husband, who was located at the finish area, met them there. 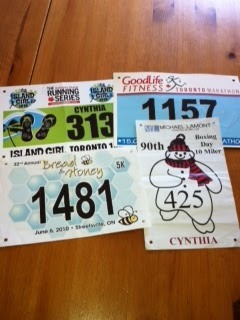 There are many times that I take my bib for granted. I’ve only seen it as a way to identify my age group and, in a multi-event, my race. Yesterday, I realized how important it really is.